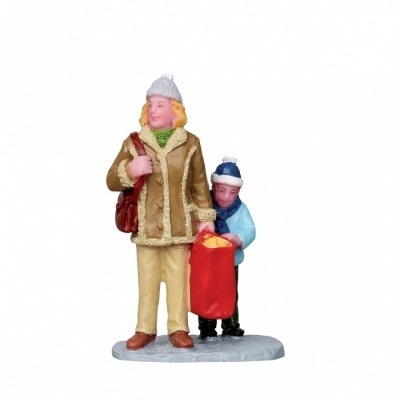 Lemax Just A Peek Figurines depicts a Mother and child out shopping, and whilst the Mother is not looking, her child sneaks a peek inside the bags for treats! A delightful Lemax scene figurine which joined the Harvest Crossing Lemax collection in 2011. Just A Peek represents two individual hand painted polyresin figures mounted on a single street base to compliment your seasonal Lemax Harvest Crossing Village display.